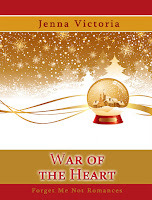 I'm pleased to introduce you to Jenna Victoria, author of the newly released War of the Heart. Thanks for visiting, Jenna! Jenna: Back in the year of the dinosaurs (ha!) I began first in non-fiction as a reporter for my high school newspaper. I pursued journalism studies in college and worked as a reporter for many years before switching to write romantic Christian fiction. I've always felt God wanted me to use my abilities for His glory. 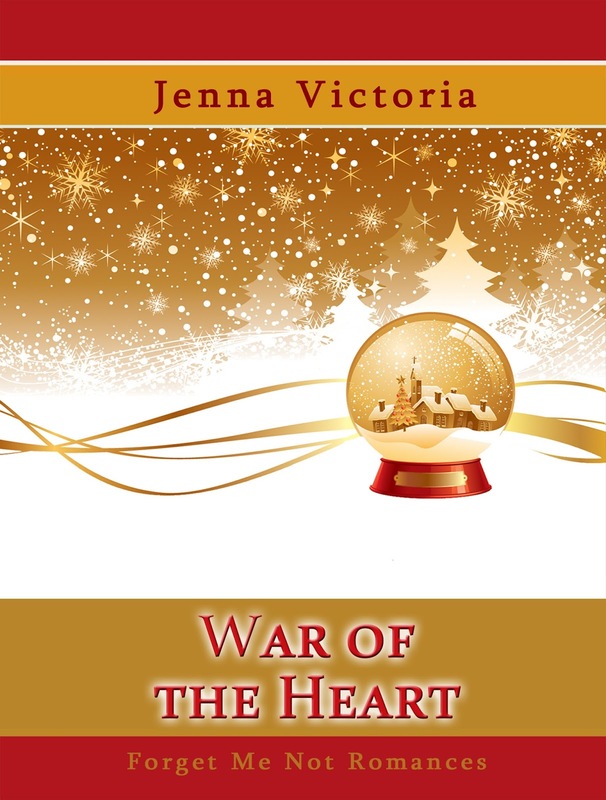 Jenna: In War of the Heart, with the help of a holiday snow globe, my American heroine Louise and British hero George go back in time to 1940's England. They, along with all of the country, face incredible deprivation and trials during Christmas in WWII-- yet their collective spirit is one of hope and incredible patriotism. I sensed many people today needed to read a story with that same message of encouragement and perseverance, as life is hard. Jenna: I disliked history in school, but was immediately drawn to details of "Blitzmas" in London, as the holiday season became known, in December 1940. I wanted to be accurate in my overall depiction. Every moment of newsreel footage and every photograph showed Londoners filled with hope and ingenuity, going about their days and fearful nights with optimism. They carried boxes with gas masks when they went outside and made meals out of the few ingredients allowed in rationing, yet were determined to carry on. I was especially encouraged by photographs of parties being held in tube (subway) stations used as bomb shelters on Christmas eve, with children being thrilled with makeshift decorations and sightings of Father Christmas. I wrote a (hopefully) realistic party scene taking place in one of those tube stations on Christmas eve as these stories touched my heart. Jenna: I used to proudly wave my "write-by-the-seat-of-my-pants" pantser flag but have realized it causes me more editing problems later if I don't at least plot out each chapter in a general way ahead of time. So now I'm a hybrid flag waver. Jenna: Louise and George try to use the same method of returning to the current time period as they encountered while being sent to 1940 to begin with. Let's just say things don't go as planned. It was fun writing about their attempts. I'll let the readers find out if they are successful or not. Jenna: I'm finishing up "Love Among the Lilacs," a contemporary love story where two elderly spinsters meddle in the lives of their beloved nephew and a skittish, pretty stranger in Grady Cove, New York. Jenna: I use social media to inform women about metastatic breast cancer (MBC for short), which affects 30% of patients who receives a breast cancer diagnosis. More than 40,000 women die every year, with virtually no research dollars going towards MBC. We call it the "pink" secret. We are already aware of breast cancer. We need to move from education to a cure! I've been a recurrent metastatic breast cancer patient for over four years now. God has given me strength to get through each surgery and continuing chemo treatment--even today--with praise and giving Him all the glory for every blessing in life. Most of all that I am still here. Linda: What else do you want folks to know about you? Jenna: I'm a sucker for a happily-ever-after, whether in romance books or in movies but I also enjoy action-adventure films where good overcomes evil. So if you ever want someone to watch a rerun with you of Sleepless in Seattle, a Hallmark Channel flick (especially at Christmas! ), The Lord of the Rings, Star Wars, or any Marvel superhero blockbuster (Thor, Iron Man, Captain America, Ant-Man), I'm your girl!